Olimex announced the first 10 prototypes of OLinuXino development board. 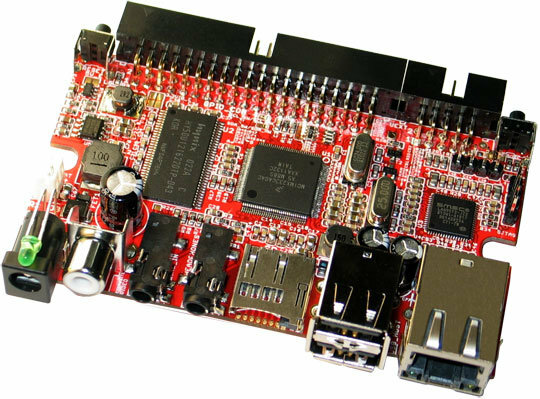 Started in March of this year, OLinuXino is a development board based on Freescale i.MX233 aiming to provide a low cost (30 Euros) open source hardware and software single board computer to run Linux. The first ten boards will be used for testing and further software development, and the company expects to have the firsst mass production batch ready in May.. The picture shows a board with TV-output *and* Ethernet. So is this the base board plus the MX-HUB? blown out of the water by the cheaper pi and *NOW? * more readily available pi ..
You’re basically right. Especially the Pi is now open hardware since they released the schematics. The platform would still be useful for people who prefer to work on lower-end embedded devices. OLinuXino might also have a lower power consumption than the Raspberry Pi (TBC).